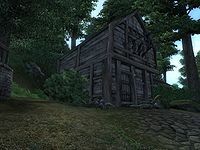 Inn of Ill Omen is an inn on the Green Road between the Imperial City and Bravil (quest-related). It is just along the road from Faregyl Inn. The publican, Manheim Maulhand, buys potions and food while only selling the latter. In addition, he will also buy your stolen goods, even if you aren't part of the Thieves Guild. This, however, is only useful after you have reached the Mercantile skill perks that allow you to barter anything with him and invest in him. The ground floor contains the reception area consisting of a bar with a counter and a dining room while the rooms are both upstairs and downstairs. The room you can rent is the first on the left, up the stairs. It is small and dark, and only contains a bedroll. The room next to yours, which is locked, contains a free bedroll. For a better, and free, stay you can use the Private Quarters, accessible via a trapdoor from the ground floor. Both rooms contain double beds, but the one in the first room, which is also locked, is not free to sleep in, unlike the one in Rufio's room. An Imperial Legion Forester spawns at the Inn of Ill Omen, the only one who traverses terrain anywhere near civilization. He can be seen practicing archery on the target outside the inn; however, his shots will always miss the target to the left. This issue has been addressed by the Unofficial Oblivion Patch; his aim is now good. You will find one regular, Rufio, in the Private Quarters during the Dark Brotherhood quest A Knife in the Dark. You can also sleep in his bed after committing the murder. If you have freed the Morag Tong Assassin while in Sundercliff Watch, you will now find him here. He is hostile to other NPCs, making him a danger to anyone in the area.